Generators are becoming more popular for a wide variety of establishments. At one time, generators were only employed by hospitals in emergency situations. Now in today's economy, if a business loses power, they can lose a lot of money. Even private residences in areas that experience frequent power outages have begun to invent in electric generators. When you're looking at generators, there are plenty of reasons to consider a used or surplus generator. The most compelling reason being cost. Buying a used or surplus generator can be a great way to save money on high quality industrial equipment. However, there are factors to take into consideration when looking to buy used or surplus equipment. One important factor in buying a used generator is its age. 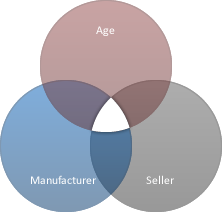 Like with any after-market machinery, age is a big factor in what can be expected from a generator. Age isn't just how many years ago a generator was made; there are other factors to consider. Usage hours are important to consider because this shows how much the generator was used. Also, if possible, it helps to know what a generator was used for. For example, backup generators are generally in better condition than generators which were used as a primary power source. Knowing what to expect from manufacturers is also important when purchasing used or surplus electricity generators. You want to make sure you buy a trusted brand with a reputation for high quality machinery that lasts. Because manufacturers matter, Surplus Generation Equipment only carries the best manufacturers. Finally, an important factor to consider is the company you are buying from. It's much safer to buy a used or surplus generator from an established seller like Surplus Generation Equipment, than someone who doesn't sell electric generators for a living. This is because an experienced generator reseller has more knowledge and industry experience to help establish what a piece of machinery is worth and capable of. Contact Surplus Generation Supply Today! Now that you know the benefits and factors to consider when looking through used and surplus generators, check out our supply of diesel and natural gas generators. Surplus Generation Supply carries a wide variety of quality manufacturers, from Cooper to Wartsila and everything in between. Check back regularly to see our new arrivals!